Well, about that list, apparently it can get longer and shorter in a matter of days. While I had not intended to ever make a set of Violin Scrapers, apparently I couldn’t help myself. But before I show you the scrapers let me show you where they came from. Now I should warn the faint of heart, an old saw was sacrificed in the production of these scrapers. 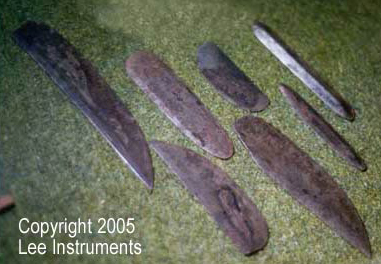 Now rumor has it the violin makers would use broken sword blades and Moxon mentions using old broken knife blades as scrapers. Well, I just made rough copies of the originals. But first of all the sacrificial blade. This blade was badly pitted, had a break and another fracture, so it met a good ending. I will make at least 1 if not two saws from the tooth section of the saw. The other pieces will be fashioned into scrapers. I even make small scrapers out of the end pieces with holes. I think I will mount the nicker nib in a special place. These are the scrapers based on the image provided by Ken in his previous comment. I am not sure of the scale, so I made them all to the same proportions to each other. The longest scraper is about 5 inches. They are not sharpened and in need of their own wallet to protect their edges. So while not on my list a few days ago, this one is now off the list. I do like their shapes. I need to seriously reconsider this list thing. Cool! I don’t know the exact measurements, either, but 5 inches for the longest sounds about right. Ah. I see. So now that you have a set of violin scrapers, you have to make a violin? Isn’t this a case of cause and effect? Thanks for posting this. Just curious…. What did you use to cut the scrapers? I have an old blade I would like to cut up for this purpose as well. So, how did you cut or break the blade? I suppose I should have said how I cut the blade. I used a pair of metal cutting shears. I did have to stone the blade of the ‘tin snips’ and they worked much better. I nipped off the corners then took them to the grind stone. I then filed the edges to remove the grinding burrs. This is cast steel, but it isn’t hardened like other edge tools. The steel is good, but a pair of fairly good shears will easily cut the material. The only problem is bending the steel to allow the shears to pass down a straight line. On the thinner strips it is easy, and the toe of the blade is easier to cut, it is thinner, so I start there. And the blades are not hardened so the teeth are just as soft as the back. The pitting will present a bit of a problem on the initial sharpening and turning the burr, but after that the pitting only adds to the look of the tool. The pitting pattern on these scrapers is actually quite attractive. Stephen… was this saw blade taper ground? Or have you ever tried cutting up a taper ground saw blade? I’m wondering if the grinding would affect any part of the process. Never tried it myself on taper ground blades. For one thing, I have no intention of making a violin, others can do that so much better. Then there is all that fretting and the controversy of the f-holes, I think they are just a long ‘s’. 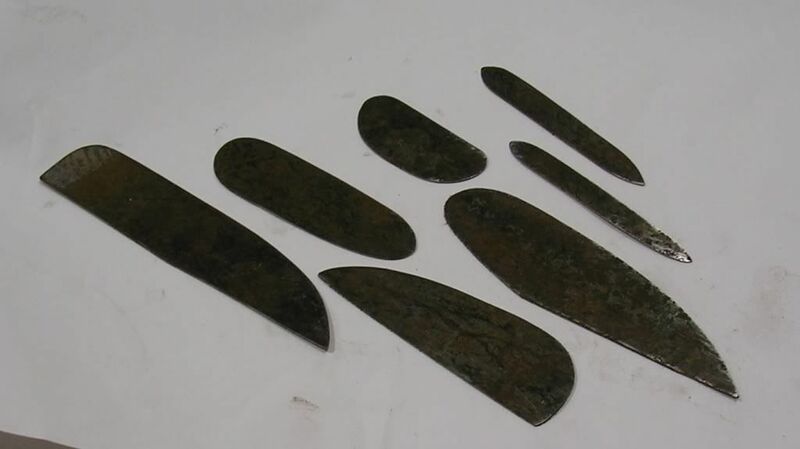 The blade was taper ground and the end pieces are thinner and more flexible. I use those for the smaller size scrapers. The thicker material I use for larger scrapers. The difference is there, but when it is cut up it doesn’t seem to matter much. Now that it is the day after, I can definitely feel it in my arms, cutting that blade wasn’t that easy, for one thing the blade had some wax on it that caused the snips to slip. I also had to touch up the shears and they worked in a more proper manner.